Mike Watkins fondly recalls the sense of community he felt growing up in Chillicothe, a small river town in southeast Ohio, where neighbors actually still talked to one another. 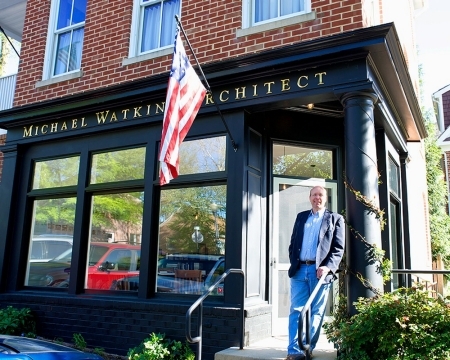 That lifestyle -- and the town planning that fostered it -- stuck with Watkins, DAAP ‘85, through his college years at UC and emerging architectural career. His work has since taken him to such places as Bosnia-Herzegovina, Guatemala and the Galapagos Islands, and he has led projects throughout the U.S. including suburban Washington, D.C., Louisville and southwest Ohio. 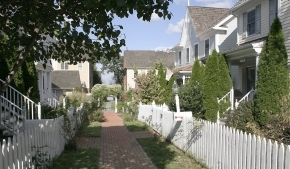 A common goal has guided him: Design-integrated neighborhoods that foster a close-knit community. The building that contains both his home and his office is part of Kentlands, a community he helped plan from a former farm estate in the late ‘80s in the Washington suburb of Gaithersburg, Md. 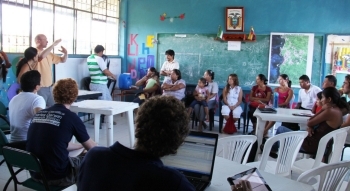 Watkins’ skill in doing this unique work has given him the official title of town architect for the communities he plans. Stops along his career path have included such ideal burgs as Whitehall, Del., and Seaside, Fla. In each locale, he has worked to ensure that individual buildings, public spaces and thoroughfares are woven together to create the fabric that supports the community concept. 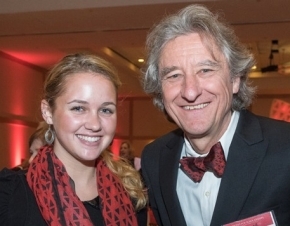 When Watkins expressed interest in architecture while in high school, an astute guidance counselor immediately recommended UC. He easily took to being a Bearcat, particularly in leveraging the co-op program to explore his new field. He recalls perusing architectural magazines and being taken with the work of a Miami, Fla., firm, Duany Plater-Zyberk & Co. (DPZ). He made contact with the principals and eventually was asked to open their new office in D.C. to become town architect for Kentlands, a 352-acre neo-traditional neighborhood. That began a 20-year stint with DPZ during which Watkins subtly shifted away from the full range of what architects typically do. “I do conceptual architectural design and master planning work and serve as town architect for a number of communities, which is a role essentially between architect and planner,” he says. “Planners tend to look at things from 30,000 feet, while architects often see their buildings as sculpture. Watkins, a fellow in the American Institute of Architects, was recently invited to join a team funded by England’s Prince Charles that is researching new ways to enhance how society and commerce might better coexist with environmental pressures in the Galapagos Islands. Their challenge was to write zoning ordinances for five island communities. As new projects -- both exotic and local -- continue to arise, Watkins often reflects on his professional roots. He now wants to become more involved with his alma mater. A 2013 conversation with Zach Moore -- a DAAP grad student who was working with Watkins on Union Village, a walkable community near Lebanon, Ohio -- reminded him that he should employ a UC co-op student in his Maryland office. He created a dedicated position through which Bearcats now rotate and has convinced DPZ to do the same. 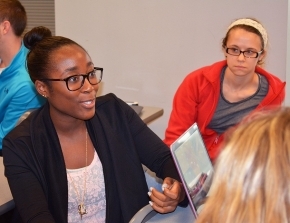 Next comes working more closely with students on campus. How a tie brought the community together to support students.